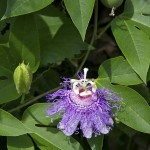 I have rooted a passion flower by taking a cut from a mature plant. I rooted in water and got lots of roots. About a month ago, I planted in pot w/soil. Now the leaves are limp and shriveled. I had it in a lot of sun then when I noticed it limping, I moved to partial sun. Please help me save this plant it was my Mother's. Thanks very much. The plant is suffering from transplant shock. Generally, it is better to slowly introduce newly potted plants to sunlight rather than putting them right smack into it. They need time to acclimate to their new environment. I would make sure it has plenty of water and move it to a less sunny location for about a week or so and then slowly introduce it to more sunlight as it strengthens. More often than not, plants will recover on their own.